It seems in the workshop one either needs one or two clamps at a time for a project, or two shops worth of clamps for a glue-up. Never anything in-between. I’ve had to glue the face frame to the bookshelves in individual pieces because of my limited number of clamps. 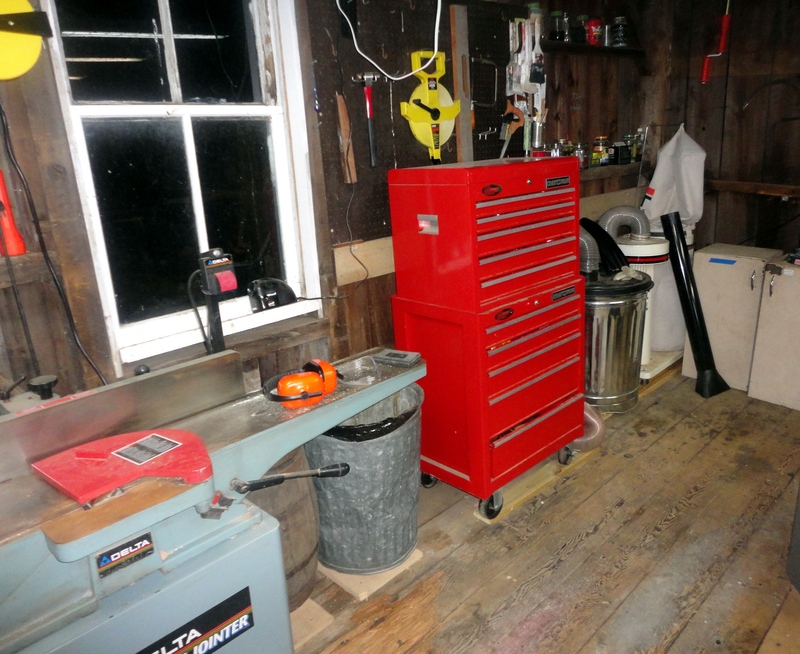 However, the current arrangement of the workshop makes it nearly impossible to walk all the way around the case when it is on the saw horses. 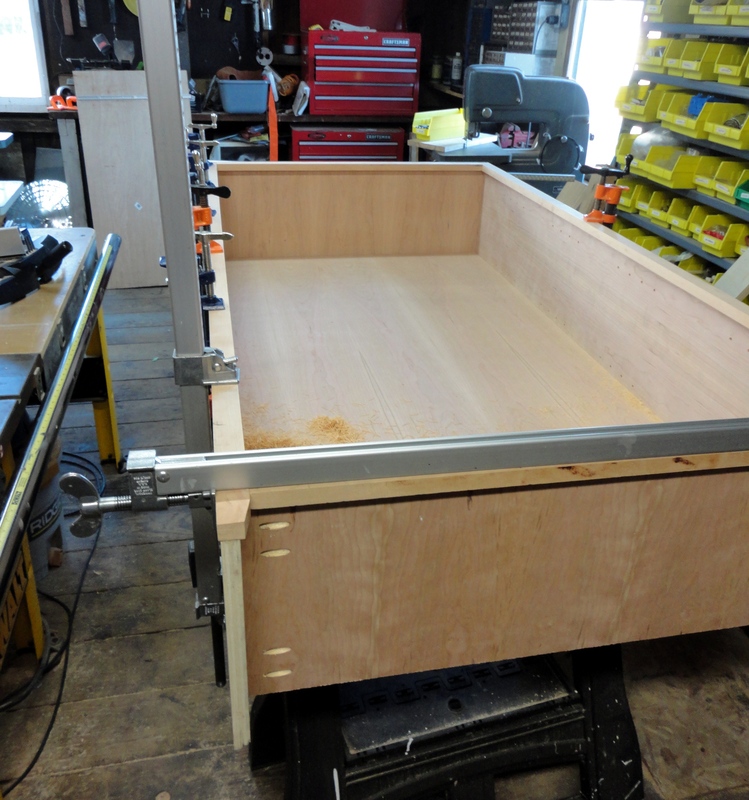 So maybe it is good that I didn’t have enough clamps to attempt a big glue-up at once. The project overall is coming along pretty quickly. It is amazing how quick a project can be done when using sheet goods (can you say no milling of lumber). 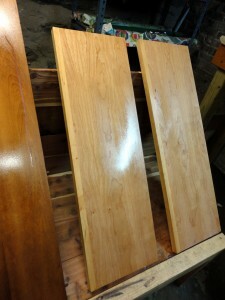 I was able to finish two of the shelves (build, glue edging on, one coat of shellac, and 2-3 coats of spray varnish). They turned out pretty nice. Cherry is pretty light colored right after finishing. A couple of months exposed to light and hopefully it will turn darker. Shelves after spray finish (plus a table leaf that had been sitting in the basement for years just waiting for me to finish). Writing in my blog – a good way to spend filling the time between the glue-up and when I can take the clamps off (and move the shelves). I think it may be time to get more clamps. Maybe a pack of 24-inch clamps from USA Clamp Company. I have 5 clamps made by them, and I love them. Plus they are way cheaper than the bar clamps purchased at most woodworking supply stores. 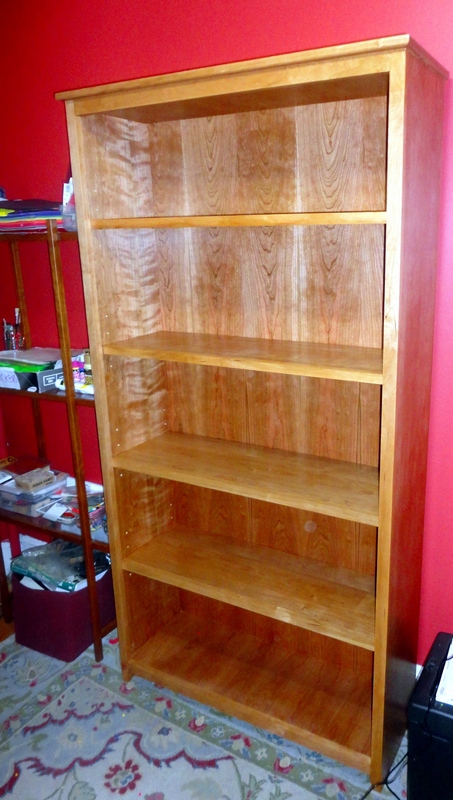 Low Cost Bookshelves (part 1). I started a new project this weekend. We are in desperate need of a set of bookshelves for the study – all the books are in boxes on the floor for now (or in the barn). 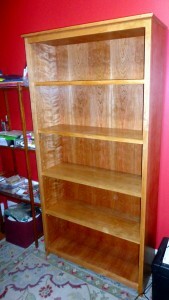 I had been searching the web to find a simple plan that allowed a set of shelves to be made from one sheet of plywood. I found this link. I am using the same basic dimensions for the bookshelves – however the construction of the carcase is using pocket-hole screws not biscuit joints. I looked at picking up plywood from GK Woodworking in Griswold. Susanna and I discussed either making the shelves out of red oak (total cost about $125 – I had plenty of red oak on hand for the face frame and top) or cherry (total cost of about $250). We decided to go with red oak. 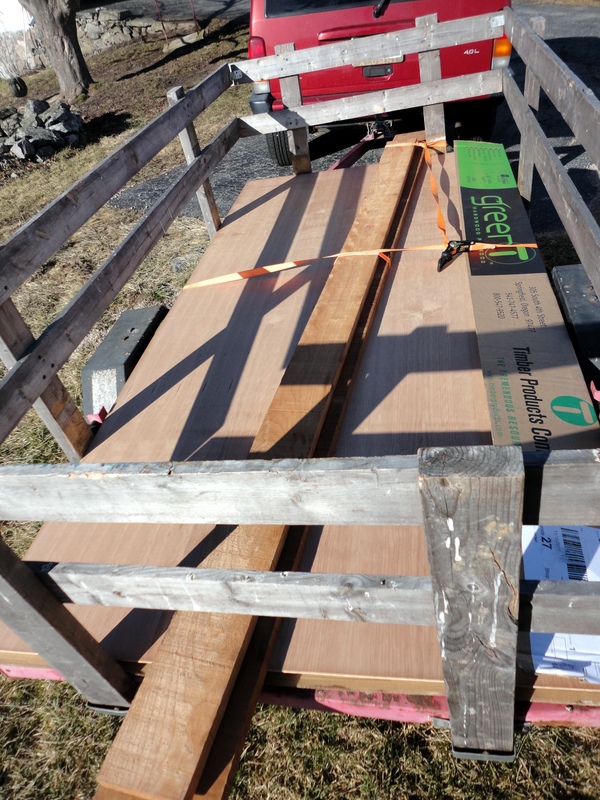 On Saturday morning I called GK Woodworking and asked about picking up some red oak plywood. He had sold his last 3 sheets of red oak that morning (apparently he sells very little red oak, but of course in one day he had two people interested). So cherry it was. Will and I headed off to pick up the lumber (while Susanna took Ben to his piano lesson). Twenty minutes and $245 later I had a piece of 3/4″ cherry plywood (for the shelves), a piece of 1/4″ cherry plywood (for the back) and 9 bdft of 4/4 (1″ thick) rough cherry. Not exactly low cost bookshelves – but I imagine that to purchase shelves already made would cost much more. Saturday afternoon I spent a couple of hours cutting up the 3/4″ sheet of plywood (2 sides, 1 top, 1 bottom, and 4 shelves). I cut the rabbet on the two sides to hold the back, drilled holes for the shelves (I will use pins to make the shelves adjustable) and assembled the carcase. 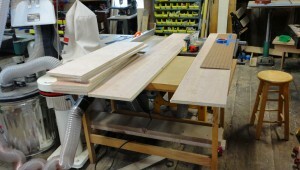 I will use solid cherry on the top to cover the top piece of plywood (and hide the ends of the sides). The pocket-hole joinery is quick and easy – if you can hide the screws. On this project the carcase is made from two shelves (top and bottom) and two sides. The pocket hole screws are on the top side of the top. That surface will be covered with a solid cherry top (not yet sure how I’m going to attach the top yet – but hey, why plan everything at once). The screws are attached from below the bottom shelf. 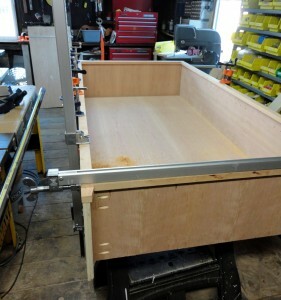 That shelf is 2 1/2″ from the bottom of the sides, but won’t be visible unless one turns the shelves upside down. Tonight I milled the lumber for the face frame and the shelf fronts. The next step is to clean up the face frame, cut to length and glue the frame to the carcase. The glue is plenty strong to hold the face frame to the carcase. My shop is not designed to easily handle 4×8 sheets of plywood. 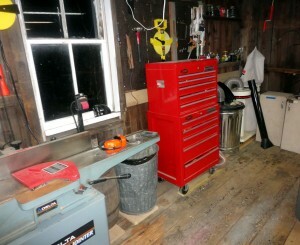 When I rearrange, I will have to leave a space large enough to cut down sheet goods. The 100 tooth saw blade that came with the table saw does a beautiful job on cutting the plywood. I have a couple of variations of this shelf in my mind to try. The shelf might look good with corner posts, though I would do them a little differently from the Woodworkers Guild of America link above – I would make them out of the same material as the shelves, and most definitely taper the legs. I might make the decorative top out of plywood, edged with solid wood – it would make attaching the top simpler and more sturdy. The problem with attaching the solid top to the plywood carcase is that the solid top will shrink and swell with the room humidity. The plywood is stable with changes in humidity (which is why the carcase and shelves are made from plywood – much better for this type of project than solid wood). I think a shelf pin drilling jig, such as this one from Woodpeckers would make drilling the shelf pin holes much simpler and more accurate. Looking ahead, I am thinking about building a kitchen island. Again, I want it to be simple and inexpensive – so I’m still thinking of options.